It has always been my wish for the Amasumo Section to function as a high quality supplement to the Ozumo and Honbasho sections on this forum, especially during non-basho months, as this is when most amateur sumo tournaments in Japan are held. With various forum members' help (such as Akinomaki and Katooshu), this section is becoming more and more of a sumo information pond than merely sumo related. It is my hope that, when a talented youngster first joins Ozumo, or when a young hopeful rises up to Makuuchi and makes everyone take attention, people can refer to the Amasumo Section to see where they came from, how they have progressed through the years, and what their main achievements have been. Take Takakeisho for example. If the Amasumo Section had been like this ten years ago, you could have found that bout when he was in Grade 5 that made him famous. You could have found this bout where he became national champion. You could also have read about his rivalry with Okura Takeru, one which has helped to shape his style of sumo for years to come. And that is exactly what this post aims to help with. The Class of 2003 is a list of wrestlers who were born in 2003. They are ranked by adding up all of their results across ALL national level competitions throughout their young life, starting with when they first stepped onto the Wanpaku dohyo as a shy 4th Grader, all the way up to when they graduate from Junior High School, ready to enter Ozumo if they so choose. On top of that, I will pick and choose a number of wrestlers among the list to go into more detail, including what sort of a wrestler they are, what stories they have to tell, and any notable results they have achieved. This is basically a "Featured Rikishi" thread that's written before they enter the limelight. Aside from being so strong and powerful, Fuma has also shown that he has a wide array of techniques available at his disposal, which is a rare trait in someone who can thrust their opponent out so easily. Take his Wanpaku debut bout for example. Despite facing a bigger opponent, Fuma held the initiative from start to finish. He tried so many things during the bout to gain an upper hand, and when he was finally able to force that double inside grip, he took the chance and finished it off. When Fuma was chosen to go up against Takatoriki in this special program, it was revealed that he lives in a large house, is a very good impressionist, and has very good grades (fourth best in his entire school year in fact). Testuya has a gym in his own home, where he has undoubtedly shed so much sweat over the years. He had an opportunity to meet Hakuho in person at a Tottori jungyo, where he promised that he will take Hakuho down once he gets to Makuuchi. Hakuho commented that Tetsuya has a very good body for sumo, and wished him good luck. Testuya has shown incredible patience in some of his bouts, for example during this Hakuho Cup semi-final. Here he was up against a very good opponent, so he bided his time, waiting for an opportunity to strike, and when the chance came, he finished off the bout in an instant. That was in the semi-final. Against a very skilled opponent in the final, Tetsuya expertly kept his opponent's right hand off his belt, which gave him the time to manoeuvre his opponents into a position where he could win in one move. Just as impressive was his Wanpaku quarter-final bout in Grade 5, on his way to reaching the final that year. It was the only time that Tetsuya has ever faced Kawazoe Fuma, and against such a strong opponent, Tetsuya needed to do something special to pull through. That he did. 2018 was when everything came together for Yoshii Ko. 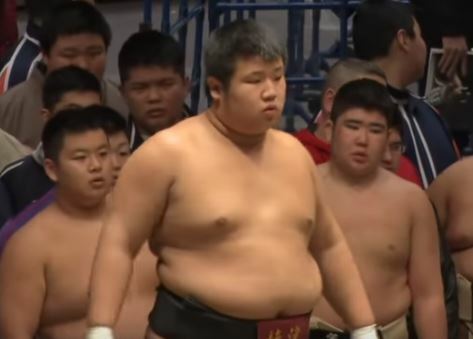 This was the year when he became Middle School Yokozuna, and a couple of months later captained Yaizu Junior Sumo Club on their way to winning the National Club Championships. Yoshii Ko has officially joined Ozumo last month, becoming a member of Nakagawa-beya. Tebakari Taiki is the middle child of three siblings. He is younger brother to Kototebakari, who is currently steadily making his way up Makushita. It's very rare to see someone so "thin" be so strong, but that's exactly the kind of wrestler Taiki is. Even from a very young age, Taiki has won his fair share of regional tournaments, so much so that Hanafusa Kai, who was near unstoppable at that time, revealed in a radio interview that he saw Taiki as his rival. Taiki lit up every single tournament he participated in last year, and everyone in the audience were always very excited to see him step onto the dohyo, because you’ll almost always see something special. The Techniques Prize that he received at this year’s Hakuho Cup was certainly well deserved. 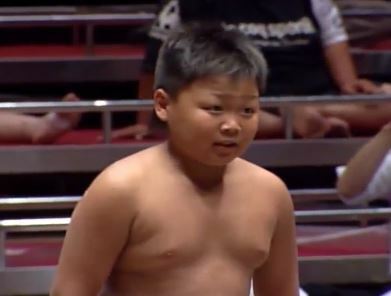 Despite being from Chiba Prefecture and having always been a member of Kashiwa Junior Sumo Club, Taiki actually represented Team Saitama in last summer's Middle School Student Championships, which Hirano Shurato's mum was very surprised to find out about. That can surely only mean one thing - Taiki will be attending Saitama Sakae High School from this month on (like his older brother). Will he follow in his brother's footsteps and enter Ozumo after graduating from High School? Only time will tell. Yep, the defending champion was knocked out in his first bout. 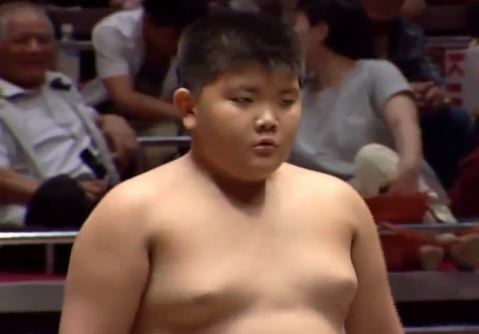 There have been occasions when a Wanpaku Yokozuna failed to qualify for next year's tournament (for example this guy), but to successfully qualify only to have this happen? That's just unlucky. If that wasn't hard enough, Hiroyuki then had to wipe away his tears and tidy up his emotions because he needed to perform the customary Yokozuna Dohyo-iri. Hiroyuki was able to redeem himself in his final Wanpaku Tournament in Grade 6, as he managed to get all the way to the quarter-finals, where he lost to, you guessed it, Fujita Kazuto. Those two really had it in for each other. Shinoda Hiroyuki's style of sumo is mainly pushing-thrusting, with the occasional throwing technique splashed in. This used to be very effective when he was younger, but as everyone else's strength improved, there simply wasn't enough variety / awareness in Hiroyuki's sumo for him to keep up, which is a trend you see in so many Wanpaku Yokozunas. Hiroyuki has not achieved anything of note since he graduated from primary school. As someone who shares a name with the best and most famous high school sumo club in Japan, Sakae Ryusei was pretty much always going to be a sumo wrestler, and quite a successful one at that. Ryusei grew up in Amami Oshima, which is a place where sumo has always been, and still is, incredibly popular. He has also been very lucky that he's had some very good training partners at Sumiyo Sumo Club, who have undoubtedly pushed him to be his best. Ryusei, who is easily the tallest wrestler in his entire year group, went into his first Wanpaku Tournament with big hopes of coming away with the title, but it didn't quite happen that way. Standing in his way, in the semi-finals, was someone who was to be the bane of his sumo life - Kawazoe Fuma. Since then however, Ryusei has been eclipsed by his Sumiyo team-mates Nishika Haruto and Hamaguchi Hayato, and has not achieved anything of note in major tournaments, though he did help Team Kagoshima to a second place finish at last year's Middle School Championships. Tears flowed when he couldn't help his team win that match. The desire to win is still there, but unfortunately, the skill set isn't. Kanzaki Oki is the younger brother of Kanzaki Taiga, who is now a second year student at Kindai University in 2019. Unlike his brother, Oki is a short wrestler, but he does pack a lot of strength, and has a very good ring sense. His short stature coupled with his varied style of sumo makes Oki a very tricky opponent to face. In fact, even the likes of Kawazoe Fuma and Ochiai Tetsuya have had trouble against him, considering that Oki knocked them out of the Wanpaku Tournament in separate years.